NOTICE: The majority of The Majestic Hotel burned down in February of 2014. 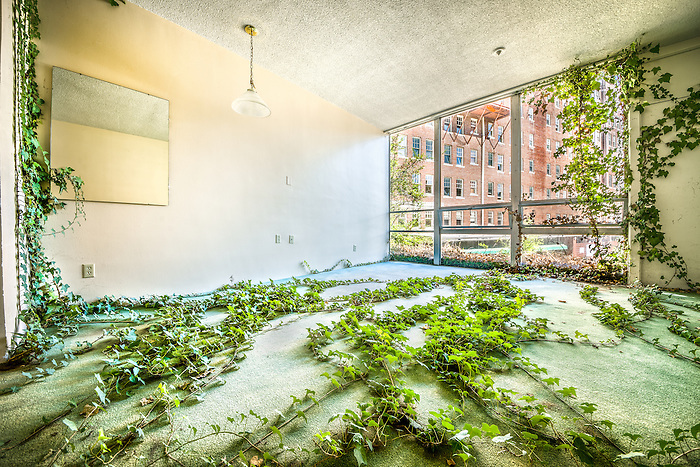 People often ask: “ How do you find these old abandoned places?” My answer is “It Depends”. Often it takes quite a bit of research, a little luck, and making the right contacts. When it came to the Majestic Hotel however, I had a little help from an extremely kind stranger. I ‘met’ Dee while playing words with friends on my phone. We played for many months and after a bit of in game conversations she found out I was a photographer and came to admire my work. She had just moved to Hot Springs Arkansas and had been telling me that I should come there to shoot the old historic bath houses and spas. So when my good friend Casey and I planned our epic photo road trip we made Hot Springs a major stop on our trip. While we were planning the logistics of the trip, Dee worked for weeks making phone calls to the owners, tracking down the nice people like the architect who is working on plans for renovation of the hotel, and eventually she had secured us legal access and a key to the front door! She even took it a step further and set up a speaking engagement for me at the “Fine Art Center of Hot Springs” where I gave an hour long presentation of my work and had some of my pieces displayed in their gallery. We met up with Dee bright and early out front of the Majestic. The old vintage signs still adorned the tops of the buildings. The skeleton remains of what once was a luxurious awning stood bare like protruding ribs. 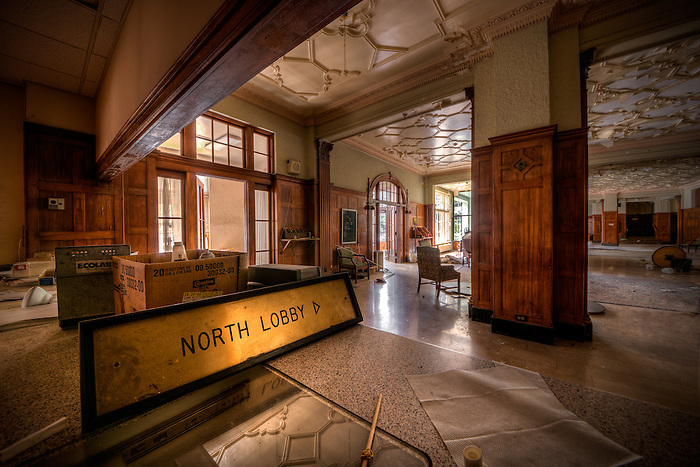 We unlocked the front door and stepped into the old hotel lobby. 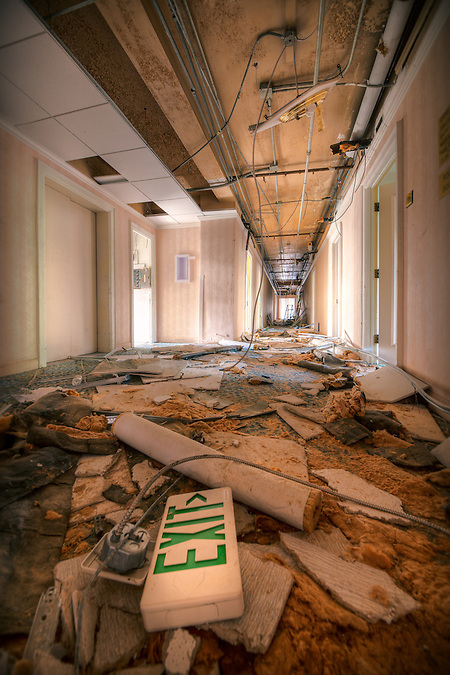 The front desk stood littered with debris. Near the front desk stood a vintage rusted out fan. 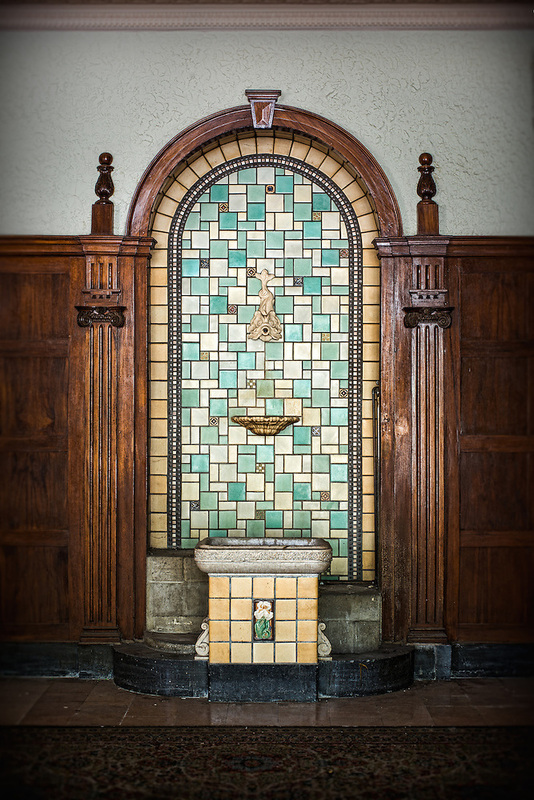 In the center of the lobby stood a beautiful ornate vintage fountain, it’s tiles dusty and longing for the natural spring water to flow over them once again. 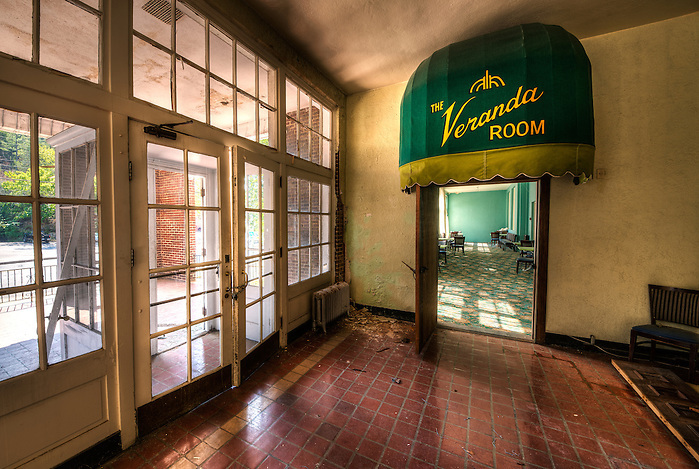 At the far end of the lobby was the entrance to the Veranda Room. 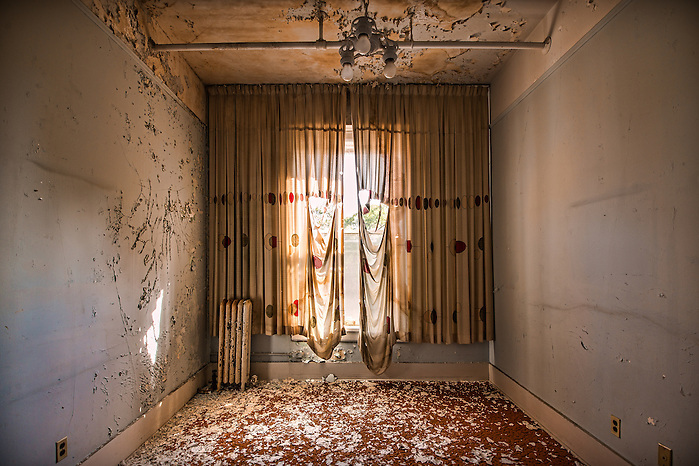 A once upscale dining area softly lit by the afternoon sun shining through the tattered and falling curtains. 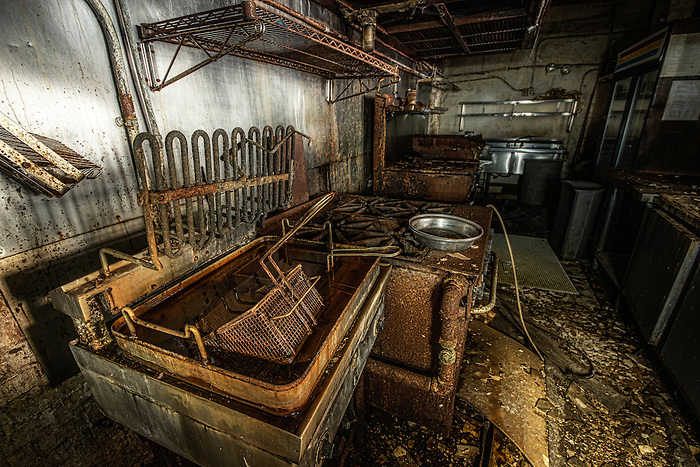 We explored back into the dark kitchen behind the restaurant. Heading back to the lobby we ventured towards the other side of the hotel and quickly discovered the old ice cream parlor. 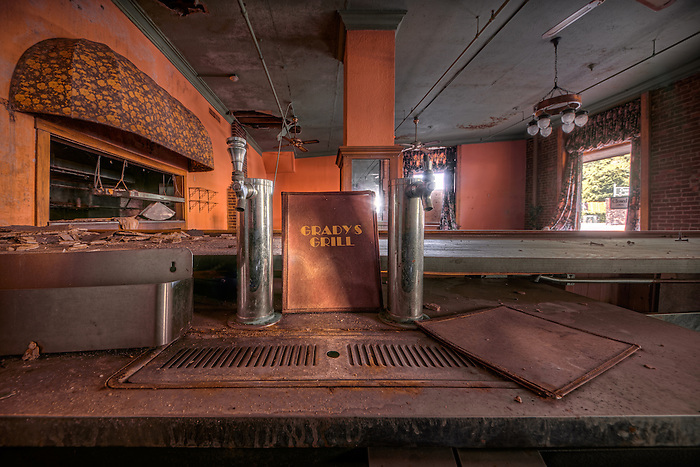 Further down the building we ran into “Grady’s Grill” which was complete with an old rusty deep fryer in the kitchen and sad drooping ceiling fans in the dining area. Not far from Grady’s was the Spa area. Two sections, one for men, and one for women. This was where the spring water was once pumped in. When the water reaches the surface it can be as hot as 140 degrees creating natural saunas for the spa clients. 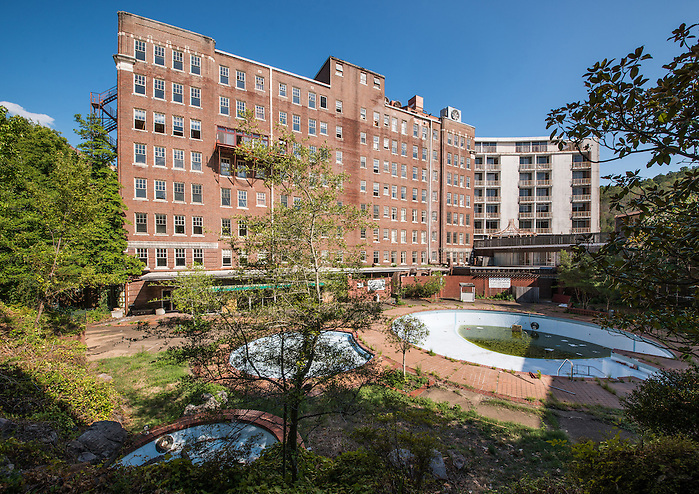 We wandered around the ground floor some more and then headed out to the center courtyard and the old round swimming pools. The entire complex wraps around the courtyard 360 degrees. We started heading to the upper levels and worked out way up to the rooftop. 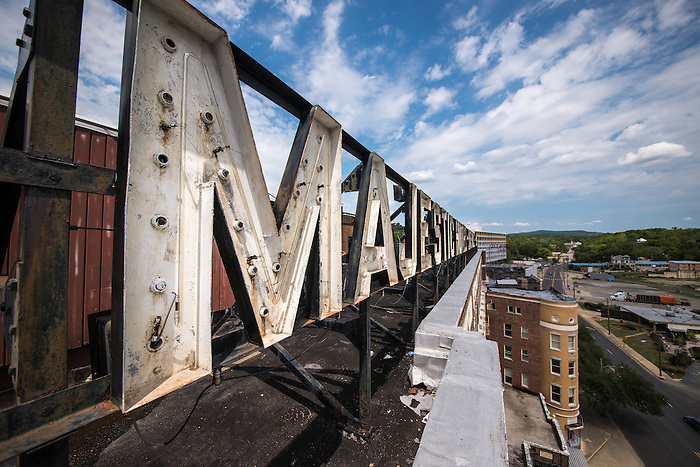 When we reached the roof, we were standing directly behind the huge letters that we had seen from the street below. 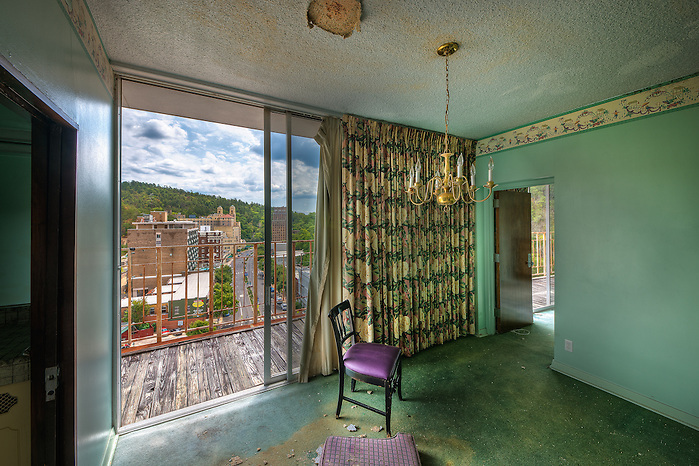 From the tenth story we had a beautiful view of downtown Hot Springs. My best friend Casey hanging out under the Majestic Signage. Me, gazing off into the distance of Hot Springs. 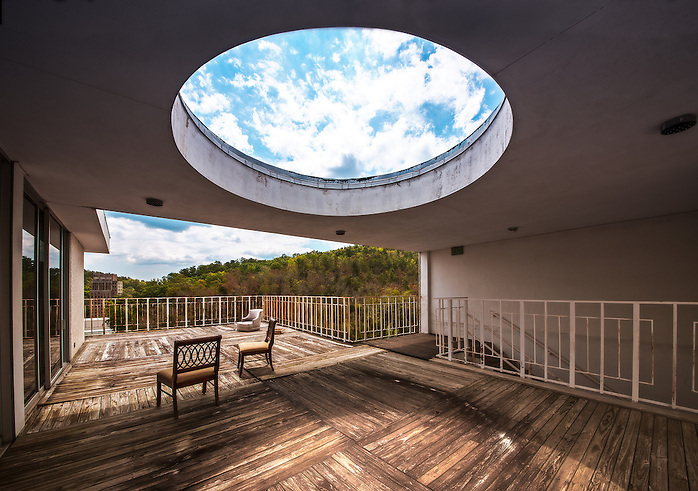 We found a roof access door that led us into one of the wings of the penthouse suites. 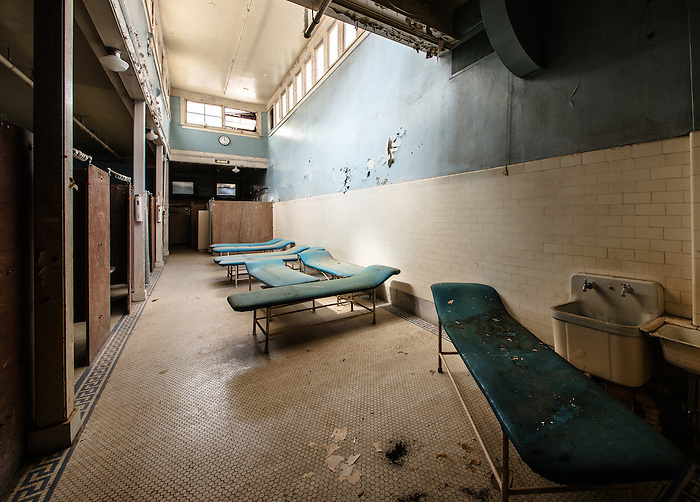 Some of the rooms were still in very good condition. Each room had a sliding door with balcony access. The old wood balcony had rotted away in spots and the boards were very soft. My friend Casey shot a video of me squeamishly venturing out to get a shot of the Majestic sign. Given that below the balcony was 10 stories of freefall I was more than a little nervous as the old boards moved and gave slightly below my feet. Afterwards I was weak-kneed for about 10 minutes! 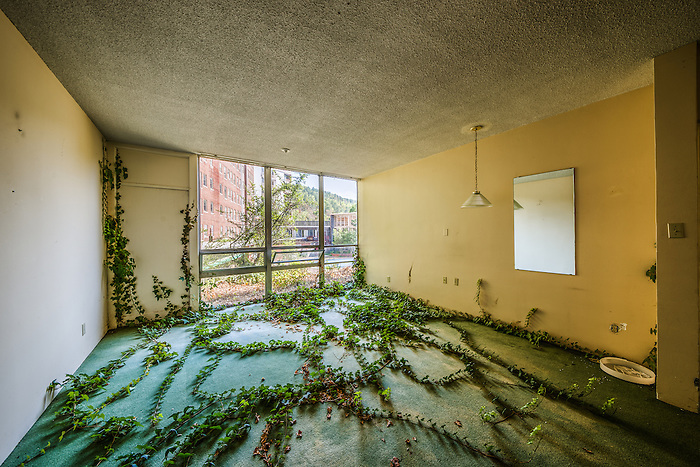 As we explored some of the rooms near the rear of the complex we found a ground level room that had massive overgrowth of vines through the windows and slowly taking over the room! 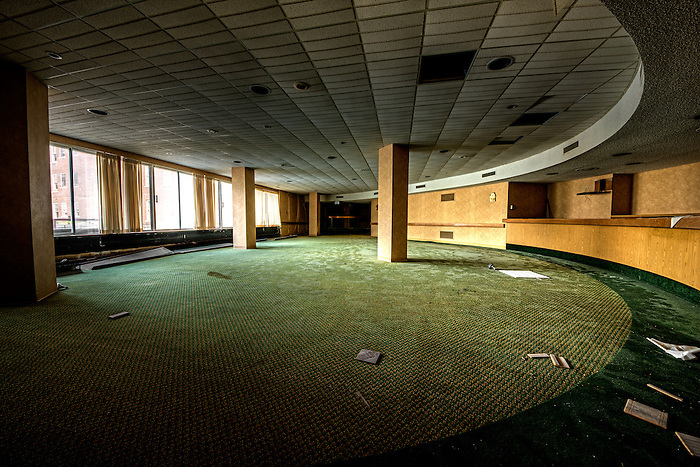 We spent the remaining time wandering around hotel, poking our heads into dark corners. There was so much to see in the massive buildings and we probably only covered about half of it in the 8 hours we shot there. According to the Architect, David French, who is overseeing the proposed renovations, they plan to start remodeling in the coming months. The idea is to have apartments for disabled people, and possibly reopen some of the old storefronts attached to the hotel. 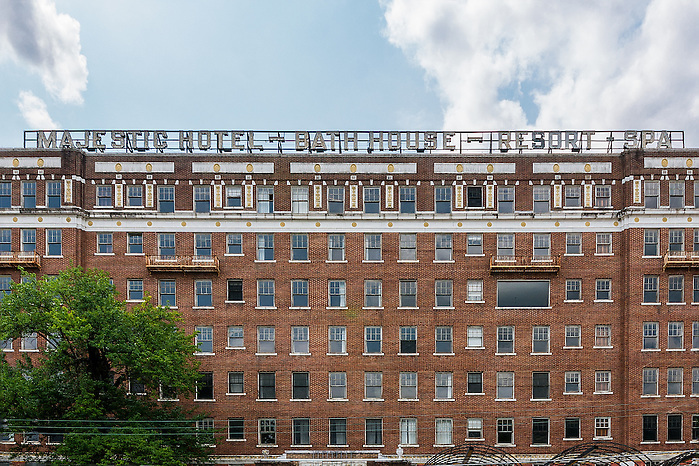 Who knows, maybe next time I visit Hot Springs they will have brought the Majestic Hotel back to life! I have been in many awesome hotels but each time I stayed at the Majestic it was like magic. My favorite hotel of all and I never felt more relaxed than when I stayed there. It was so sad when we found out that it had burned and no longer would I be able to enjoy that special place. I knew Joy Scott. Her mother owned the hotel and she pretty much grew up in it. Later it became hers. Grady was her father’s name. At one point she had her own scent for sale in the soda fountain. I stayed there in 1995 for the last time. Now I hear the family has sold the Arlington as well. Happy I got to visit Scottland, their house on the lake and jump off the bridge, as had Joy. The Scotts remain the most interesting and educational people I have ever met. Bless them all. Time flies when you are having fun. Also, I am glad I took a few photos of the place myself. 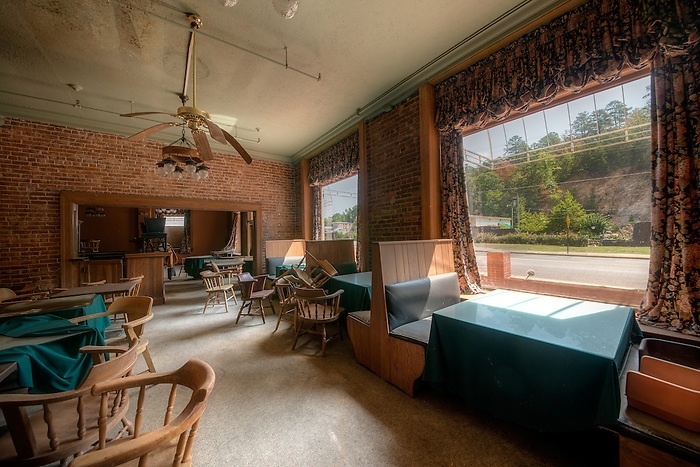 Once upon a time when I worked in downtown Hot Springs, we were regulars at Grady’s Grill. There was an old Black man who was the Absolute Best grill cook! He could make anything (sorry if I offend anyone). I sure miss it. It was so tragic watching the news when it burned. Like a part of you was burning with it. It’s also tragic that it has taken so long to do something with the property. Thank you for the photo reminders. They are beautiful and the architecture allows it to live up to it’s name – Majestic. There will never be another. Any updated news on the majestic? Broke my heart when it went up in flames. The only surviving part of the structure is the newer add on, all the historic beauty is gone, its where the fire started. I’ve heard a couple different places that say the fire was intentional. Either way its sad. 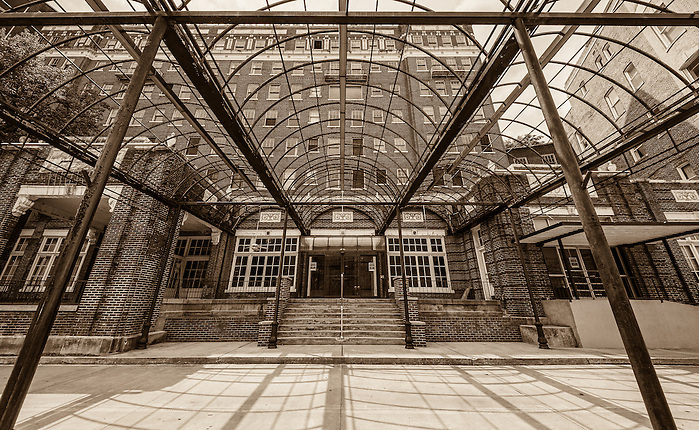 I am so glad that I ran across your collection of photos from the Majestic Hotel in Hot Springs. Hot Springs was not far from where I grew up in Texas and it was the first place my parents went on vacation after getting married. 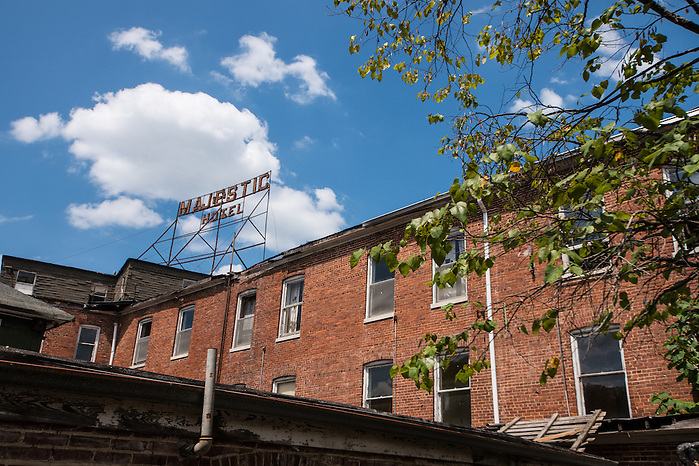 When I was two years old it was my first destination as well and we continued to escape to Hot Springs once a year into my adulthood, always staying at the Majestic. It was incredibly sad to see the decline of the downtown area in general the past few times I visited. And hearing about the fire and demolition just days after seeing your photos here was so saddening to both me and my parents. Thank you for your good work and for preserving these images for those of us who remember the sites so fondly. Thank you so much for sharing your history and connection to the Majestic and Hot Springs Kelly! 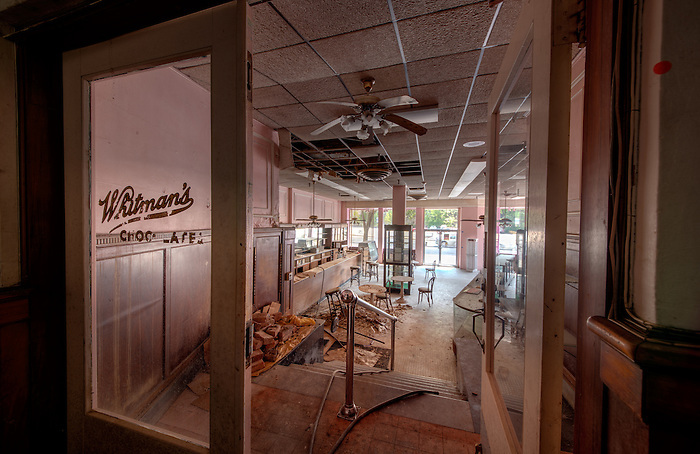 The guys from NatGeo’s Abandoned tried to buy a lot of the stuff in these pictures, & after the recent fire, I wonder if the Wheatelys regret not selling the sign, the fountain, & other historical pieces. Thank you for giving us these beautiful memories. I had always looked at it and wondered from the outside, I never knew what beauty it actually held within its doors. It is now immensely more sad to know it is gone. 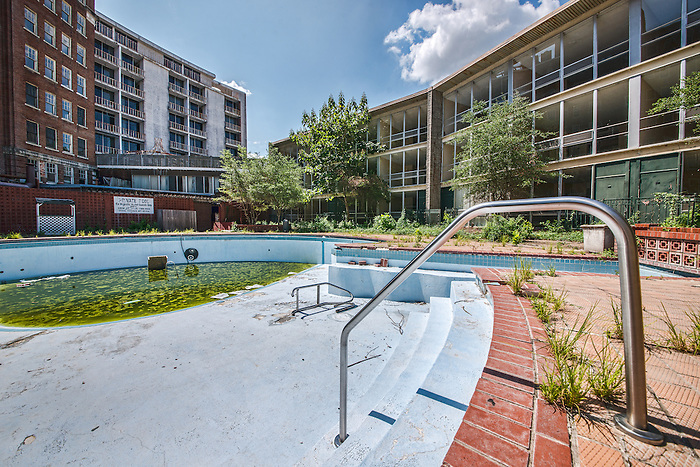 so glad we have these pics to remember–Hot Springs is not progressing—the good ole boys have done us wrong and are still at it. So sad to see the Majestic and all it’s magic burn down. I stayed there with our youth conference in the early 1980’s. 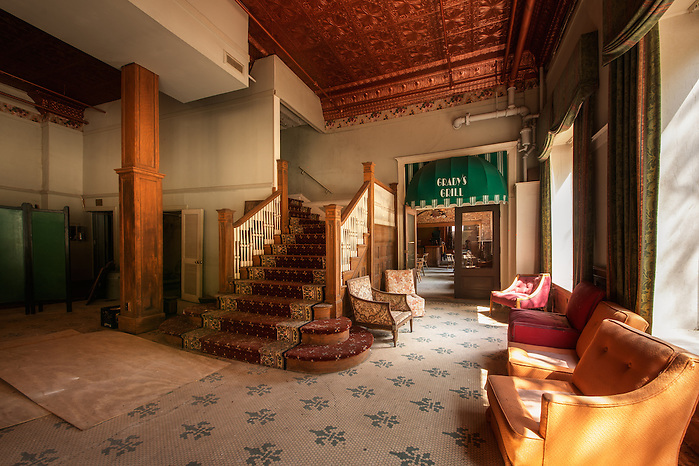 My Mom talked about the old days of downtown Hot Springs and the Majestic was always mentioned- it was truly a majestic hotel. Such a shame it wasn’t restored. 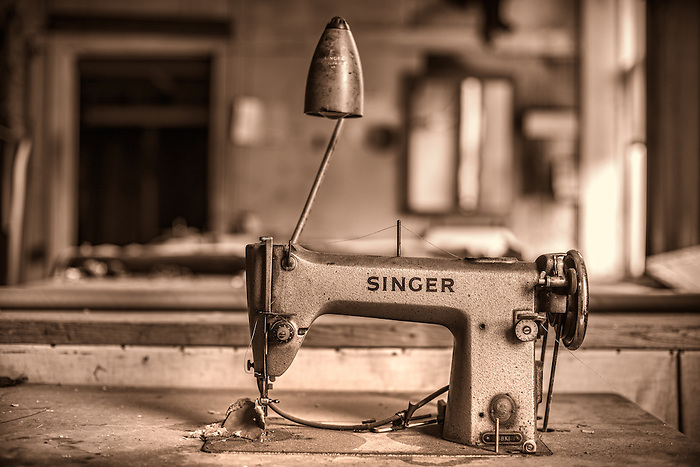 We are losing so much of our history and artifacts and this one could have been saved and restored. People love staying at old historical facilities. I wish the historical society could have stepped in and saved it. Thank you for taking these pictures and sharing them with us. 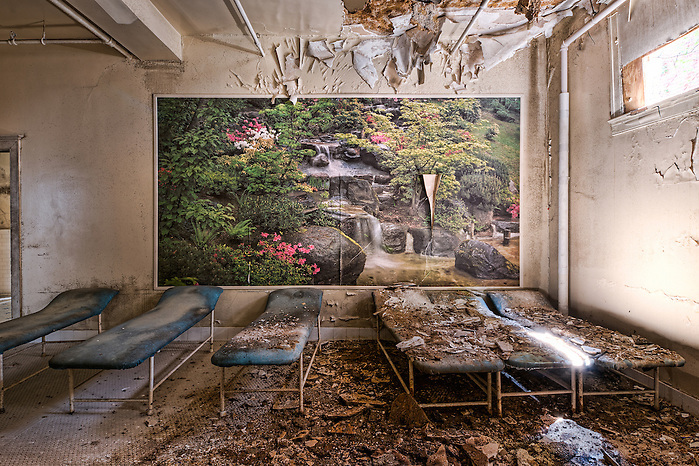 This was a beautiful collection of photos, sad that they only portrayed the abandonment of the place. Sader still that I only saw this the day after the building was in flames. Loved reading the stories others shared. Thank you for the time you all took to share this with us! 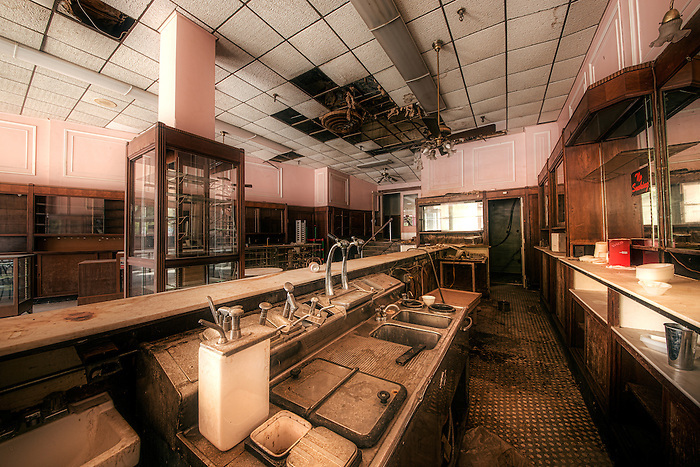 Thank you SO MUCH, Mr. Arnold, for preserving this historic building in photos. Since the fire was still burning as of 7:30 this morning I sadly assume this may be all that will ever be left of a once glorious building/moment in time. So sad, stayed there many times! 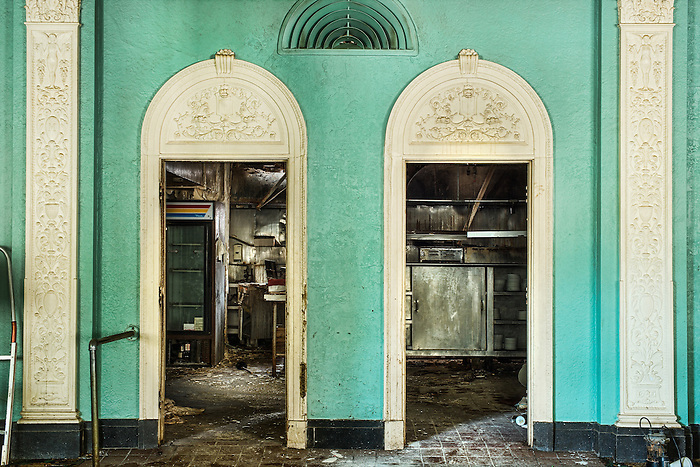 Thank you for these absolutely gorgeous pictures of a beautiful building that once was. I have never been inside this building, only able to admire it from the outside. These pictures make me feel as though I was actually there. It saddens me to see the building destroyed forever. 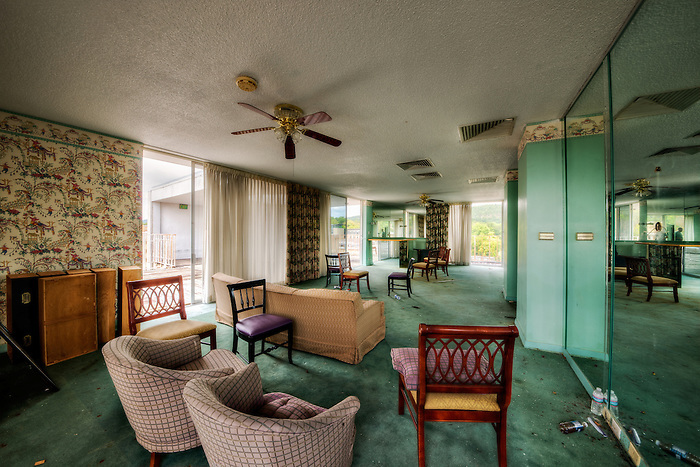 These pictures will live on as a wonderful memory of this once majestic hotel. As I watch the news about the Majestic being on fire, I go back to the stories that my Mom told me of her growing up in Hot Springs. One of the places she lived was just a little ways up Whittington close to the Majestic, there was a little bridge crossing Hot Springs Creek to get to her house. She would tell me of the hot summer days when she would go get an ice cream cone at the sundry shop, but only if she found a nickel lying on the street somewhere. Thank you for the tour of the hotel, I would like to see more of the old yellow brick part of the hotel, the original. Possibly find a photo of way back when up against a photo of today?? That would be really nice! Sadly, the Majestic Hotel is on fire right now, and it doesn’t look like it will be saved. We’ve finally lost this historic building. Thank you for preserving the memory of the Majestic in these lovely photos. At this very moment (6:40pm 2/27/14) The Majestic is on fire. There are three different firefighting teams working to contain the blaze. They have been ordered not enter the building and have said they are in defensive mode with the fire. 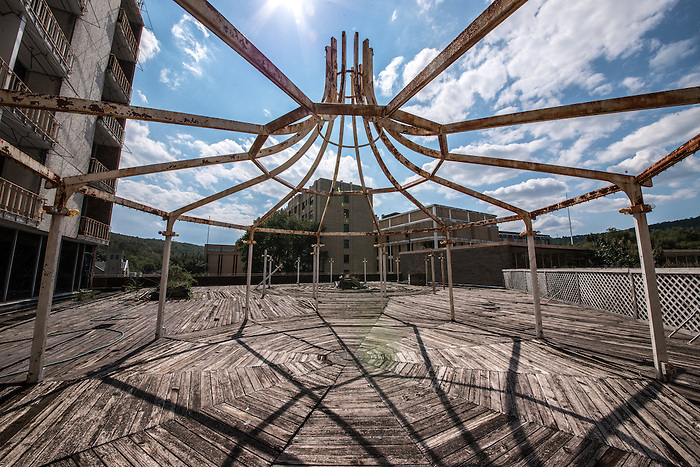 It is a sad day for this Hot Springs landmark and I fear she will not recover. 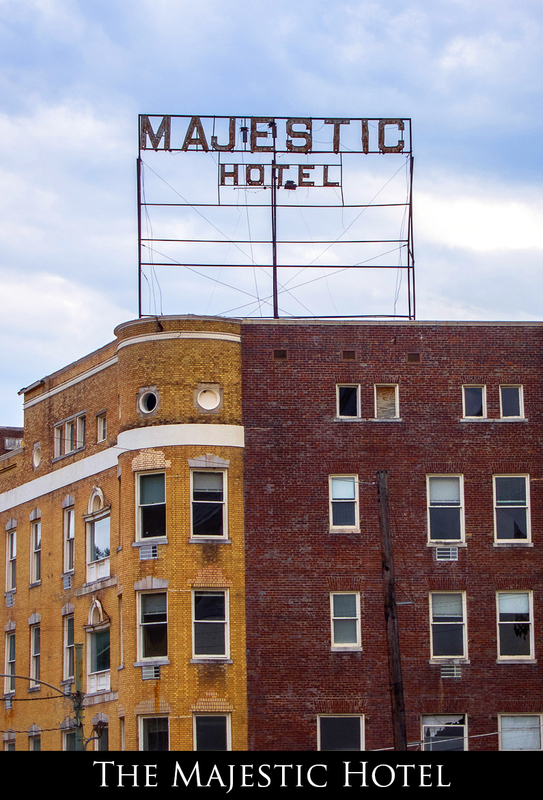 I got married in Hot Springs in 2/86, and stayed at the Majestic. Just loved the place. Its a shame its gone. Enjoyed the tour very much. I would like to see a tour of the original yellow building though. I must have stayed there just before it closed. The pool was still open and my room was just above the pool bar with the beautiful, aging deck. I took tons of pictures and spent a lot of the time I was there imagining it in its heyday. It must have been a fabulous place. The spa was still open then, and so was the small store. There was only one meal served there daily (I think it was breakfast), and the rest of the time you were on your own. It’s such a shame. I felt like I was seeing the dying of a grand old lady. My dad was a lifeguard at the Majestic, and grew up in Hot Springs. So sad to see the way it’s fallen apart. My husband and I have a paranormal investigation group (Paranormal Ozarks Investigations), and we’d LOVE the chance to go down and take a tour and do a little investigating. I’m sure there are a lot of stories hanging out in those walls. 🙂 LOVELY images, thanks for sharing! Ooooooo that would be so cool Laurie ! I would love to tag along on that visit with you guys ! So much scary fun ! We had to ‘buzz the fountain’ every time we ‘used’ the car in high school….then to Benny’s for a pizza…. and back to Bob’s Drive In. This is amazing. I just saw the video you had up on Facebook and thought “I remember Dee telling me she took a friend to the hotel!” She was a client of mine when she lived in HS! (Hair) and I heard about your work from her. Perfect images. I hope they use all of them in the building when they reopen! Wow, from the pictures and from what I have seen personally outside…I would never believe it only closed down in 06′. 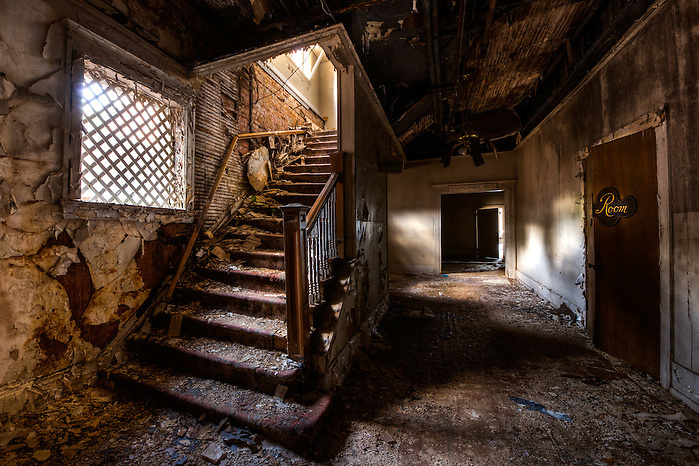 It is sad for old buildings to run down It will cost a fortune to put it back in its glory. My husband and I visited Hot Springs 2 years ago for our Anniversary and we stayed at The Arlington. We feel in love with the city so much that we bought a second home there. When we visit, I love to come downtown…. Hopefully, they will get the ball rolling before more damage is done. Loved your pictures! I grew up at the Majestic, as my Dad was manager there from 1954 to 1982. We lived in a house right behind it, which has since been torn down. The Majestic was a beautiful place in those days and very popular. The pool area was picturesque, to say the least. 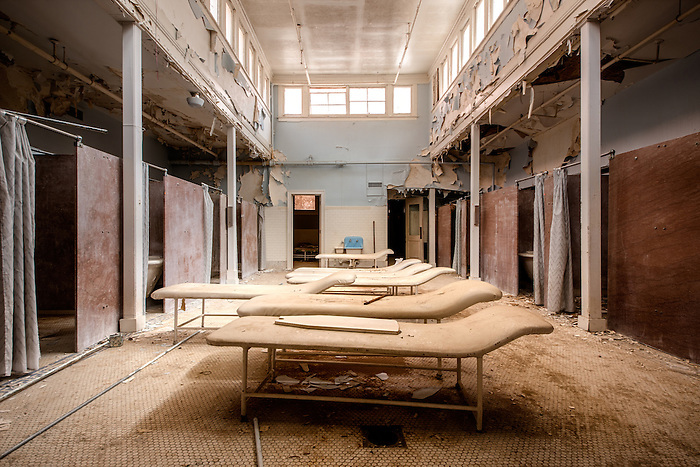 It makes me sad to see these pictures, but I hope and pray that it will be renovated and utilized somehow. Thank you for sharing. My wife worked at the majestic hotel 35 yrs she was the last manager oct 26 2006 when it closed. Whew…I would love to hear some ghost stories! These pictures are just fantastic. I worked for the Majestic and Arlington hotels from 1999-2007 and sold the Majestic and the Arlington for Groups and conventions. I can’t believe how much it has gone down since it closed. I have a lot of good memories there — and Grady’s was THE place to eat right up until the hotel closed. I am so very sad to see what the last 7 years have done to the beautiful old building. 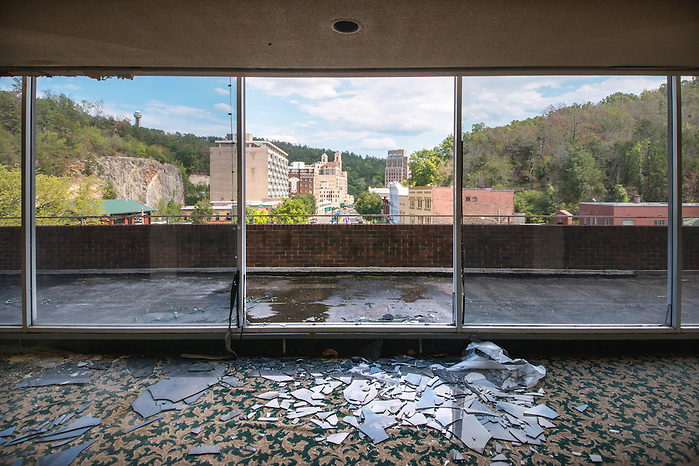 I am a lifetime resident of Hot Springs and have dined at Grady’s many times, I stayed in the Penthouse and wonder why in the world have the owners allowed broken windows and a falling roof to cause so much damage. Truly if you cannot afford to protect it let someone who can. I have lived in Hot Springs for 13 years now and this once beautiful town that was full of life is, in fact, facing its fallout. We have more historical buildings than anywhere I’ve ever been, that will likely never see renovation. I remember when I was 4 and 5 years old, both my grandma and my aunt worked in the Majestic Hotel, in the Ice cream parlor, or what they called the sundry store. As I looked at each of your pictures, everything came alive to me in vivid colors, sitting patiently with my coloring books every day waiting for some sort of treat and looking out on passing cars, wondering what else lerked in the old hotel. What I didn’t know then are the things beautifully expressed in your photos. I truly have a special appreciation for this. Thanks for your comment Katie! I always love hearing the connection that others had to the locations I explore and photograph. Thank you for sharing your story! 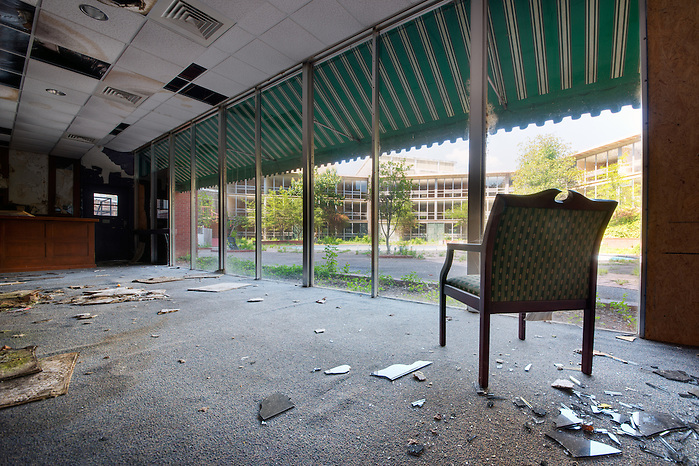 You should see the old Malco Theatre building in downtown. Yet another historic old building falling apart in Hot Springs. Jim we actually did get to shoot inside the Malco. That was interesting as well! So now it’s Feb. 2013 and I haven’t heard anything about work on the Majestic. 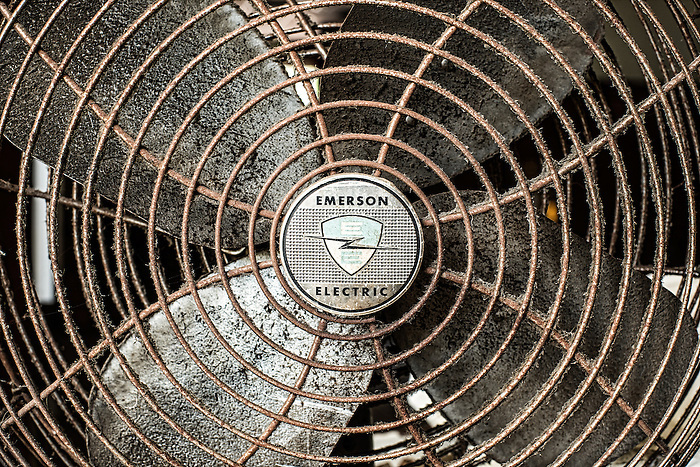 However, every so often you read about folks getting caught trying to steal metals or -last one ,air conditioners. 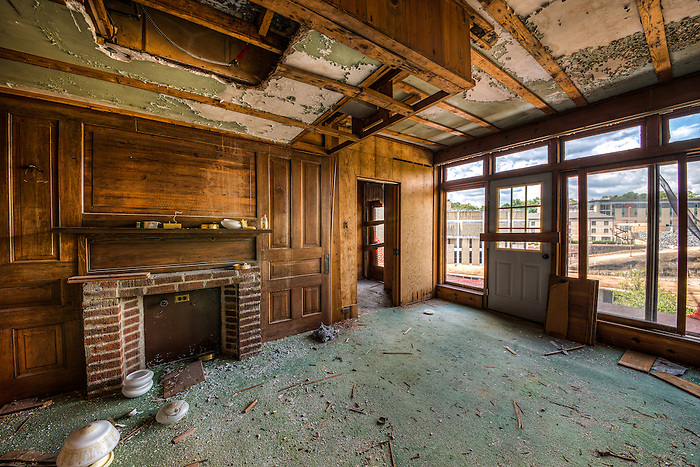 It’s such a shame because,as we know from your photos,there’s still beautiful wood and plaster work inside. I can never understand why buildings are allowed to run into the ground while people ‘think about’ renovation. hopefully soon some work will start before more damage piles up. You did such a beautiful,respectful job here’s hoping it inspired them. Thank you for your kind words Martha! I hope that they can get started soon. I know it’s a big project but it would be worth it! Love the tour of the old hotel. Watched “Midnight In Paris” last night about being able to go back in time to what you thought was the golden age…..oh, how I would love to go back to each era of this hotel. My husband and I stayed there in July of 2004…..we loved walking around the old hotel and exploring…took alot of pictures….I even have my Majestic folder that they leave on the desks…stationary, prices of services ……my husband and I wanted to go back…had no idea it closed……you could defintely feel a presence of the “past” in the hotel…..especially the older parts of the hotel….Loved it. These are wonderful pictures. I stayed there once in 2000 and it was showing it’s age. I had heard that it was demolished. Am visiting this weekend and will see for myself. Thank you for posting these pictures. 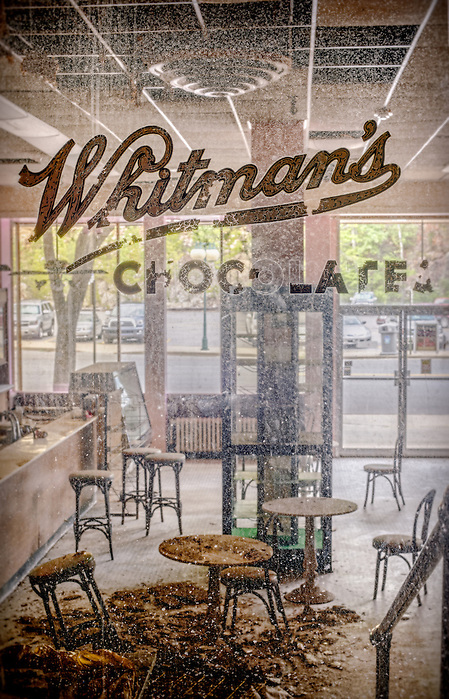 I love the shot of the Whitman’s Chocolate sign in the window with the room behind it. Nice work overall.